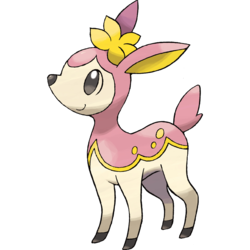 Deerling in game: 7,346 Who? Important notice! Pokemon Deerling is a fictional character of humans. 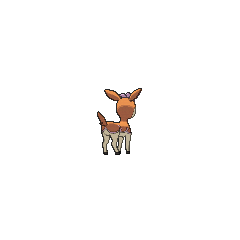 Deerling (Japanese: ???? Shikijika) is a dual-type Normal/Grass Pokémon introduced in Generation V.
In Generation VI, Deerling can be bred in any form at any time if the parent is of that form. Deerling is a fawn-like Pokémon, most resembling a fallow deer. The upper side of its body is pink during the spring, green during the summer, orange during the fall, and brown during the winter. It has a yellow patterned rim, and its underside is light beige. It sports a yellow floral tuft on its head, and similar yellow coloration on the insides of its tapering ears. The tips of its limbs are colored black and its pink tail is small. It can change in appearance with the changing of the seasons. If it senses animosity, it hides in tall grass. It moves in herds as it is timid around humans. It dwells in sparsely populated areas, away from humans. It is herbivorous. A herd of Spring Form Deerling appeared in In The Shadow of Zekrom!. Another herd appeared in Enter Iris and Axew!, where Ash attempted to catch one; however, as he had not weakened it, the Deerling was able to deflect the Poké Balland fled with the rest of the herd. A Spring Form Deerling owned by Daniela appeared in Here Comes the Trubbish Squad! where it was used to battle against Ash and his Pikachu. A wild Spring Form Deerling made an appearance in Sewaddle and Burgh in Pinwheel Forest! when Ash's Sewaddle accidentally latched onto it with String Shot, startling the Deerling and causing it to buck and thrash around wildly through the forest to get Sewaddle off, putting Sewaddle in serious danger. Ash saves two Deerling from falling off a cliff at the beginning of White—Victini and Zekrom and Black—Victini and Reshiram. In Victini and Zekrom, the Deerling were in their Autumn Form while in Victini and Reshiram, they were in their Summer Form and Autumn Form. 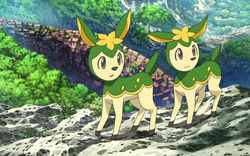 Summer Form Deerling made their debut in The Four Seasons of Sawsbuck!. Ash and Robert followed one in order to find Sawsbuck. A Summer Form Deerling owned by Katharine appeared in Scraggy and the Demanding Gothita!. Two Summer Form Deerling appeared in Team Plasma's Pokémon Power Plot!. Two Summer Form Deerling also appeared in Genesect and the Legend Awakened, helping to put a fire out at Pokémon Hills. Deerling have made brief cameos in many episodes such as A Sandile Gusher of Change!, Iris and Excadrill Against the Dragon Buster!, and Gotta Catch a Roggenrola! as background Pokémon. Many Trainers have been known to own Deerling such as a Trainer in a flashback in The Battle Club and Tepig's Choice!, where it was seen to have defeated Tepig before it was caught by Ash. Dino's Spring Form Deerling was used against Omega's Patrat in Reunion Battles In Nimbasa! and won, allowing Dino to advance to the second round of the Club Battletournament. Autumn Form Deerling have a minor cameo at the beginning of Pokémon The Movie: Black—Victini and Reshiram. A Spring Form Deerling appeared in Lost at the Stamp Rally! performing in a Pokémon Musical show. A Deerling appeared in Clash of the Connoisseurs!. A Summer Form Deerling briefly appeared in Jostling for the Junior Cup! and Ash, Iris and Trip: Then There Were Three!. 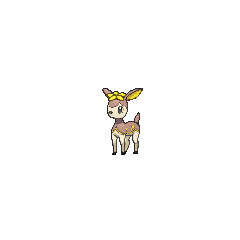 A Spring Form Deerling briefly appeared in the elder's flashback in A Village Homecoming! and also in one of Iris's flashbacks in Drayden Versus Iris: Past, Present, and Future!. 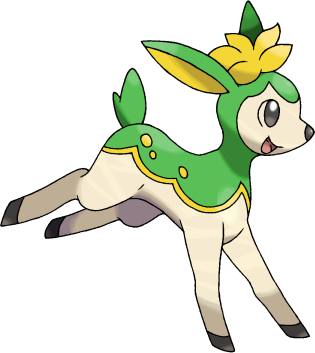 A Summer Form Deerling appeared in Saving Braviary. Multiple Summer Form Deerling appeared in Secrets From Out of the Fog!. A Trainer's Deerling appeared in Cilan and the Case of the Purrloin Witness!. Multiple Summer Form Deerling appeared in The Island of Illusions!. 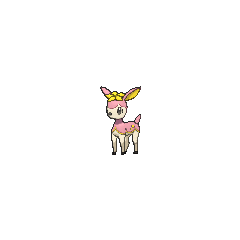 A Spring Form Deerling appeared in a fantasy/flashback in The Journalist from Another Region!. A Summer Form Deerling appeared in Celebrating the Hero's Comet!. In the Black & White chapter, a Spring Form Deerling was seen under the ownership of a female shopkeeper in Striaton City. Darlene, a female Deerling, was captured by White during her preparation for the Battle Subway trial. It was seen in its Summer, Autumn and Winter Forms. Shikijika is a combination of ?? shiki (four seasons) and ? shika (deer). Korean ??? Sacheolrok From ?? sacheol and ? (? )lok; literally "four seasons deer"
Mandarin Chinese ??? Sìjìlù From its Japanese name. Literally "Four season deer".